Installation inspired by the polysemy of the sophisticated geometric patterns called Kené, created by the Shipibo-Konibo, an indigenous group from the Eastern Peruvian Amazon. CROSS PATTERNS deals with and questions an invented tradition created among the Shipibo-Konibo in the early 1980s. For centuries, the Shipibo-Konibo have had contact with missionaries, explorers and researchers, many of whom combined reality with fictional narratives or creative imagination when referring to them, mixing direct observation with storytelling, the real with the wonderful. In the early 1980s, a German anthropologist outlined the idea that the intricate design art of the Shipibo-Konibo may once have been a codified system of meaning, but that only the “shamans” preserved this knowledge and could sing the Kené designs, as if the patterns embroidered or painted on fiber surfaces were “soundlines”. She proposed that the songs of the Shipibo–Konibo “could be heard in a visual way, and the geometric designs may be seen acoustically”. This idea, that relates not only to a European concept of musical notation, but also to a European concept of time, was not part of Shipibo-Konibo life before being introduced by the anthropologist. Surprisingly, it made its way into ethnographic reports and was not only accepted by the scientific community, but eventually by the Shipibo-Konibo people themselves, who made up ways of attributing musical meaning to certain designs. CROSS PATTERNS was a tactile and poetic way of approaching this invented tradition, by following one of the most observable instances of history-in-the-making, where fiction started to replace reality ­ and actually became reality. CROSS PATTERNS synchronizes mechanical and digital media. 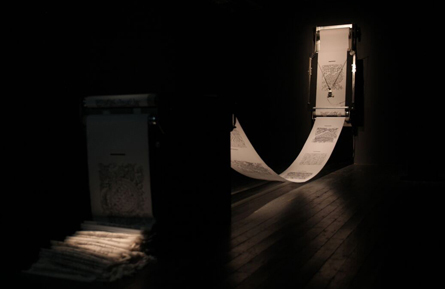 By following the songs of the Shipibo-Konibo, a programmed and motorized mechanism draws patterns on a textile surface. 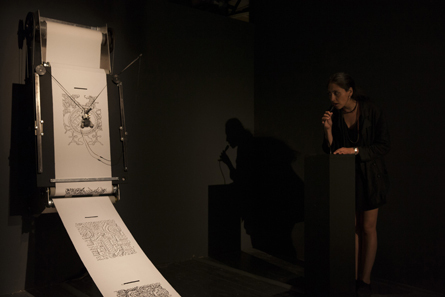 Through a microphone, the viewer can interact with the sound and change the course of the drawing. Later, the patterns that were created, whether modified or not, are read back as music. 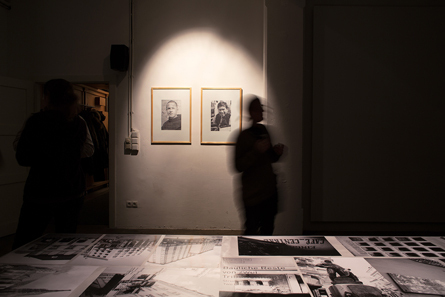 The installation has a programmed cycle of operation, between the making of drawings and their reading. Once the machine finishes this cycle, it will sit idle for a few minutes. If the machine is in its standby period when you enter the exhibition space, you can activate it by pressing the red button located on the front of the support in which the microphone is placed.